On multi-user plans (Cacoo Team, The Education plan) user management occurs on the Nulab Account. To use the Team or Education plan, members need to be registered to access the organizational space. Please Note: Only the administrator of the organization will be able to see this button. If you’re a Member Plus user, you can invite users from the Nulab account page directly. If you need to add members but are not the administrator or a Member Plus user, please ask your administrator to follow these instructions. This will open the Nulab account in a new window. You’ll see the option to dictate their member role. Select the member role, click “Next”, then enter the email addresses of every intended recipient. After entering the email addresses, click the button that says “Invite X Member” (Please note: X is a variable used to reflect the number of invited users). 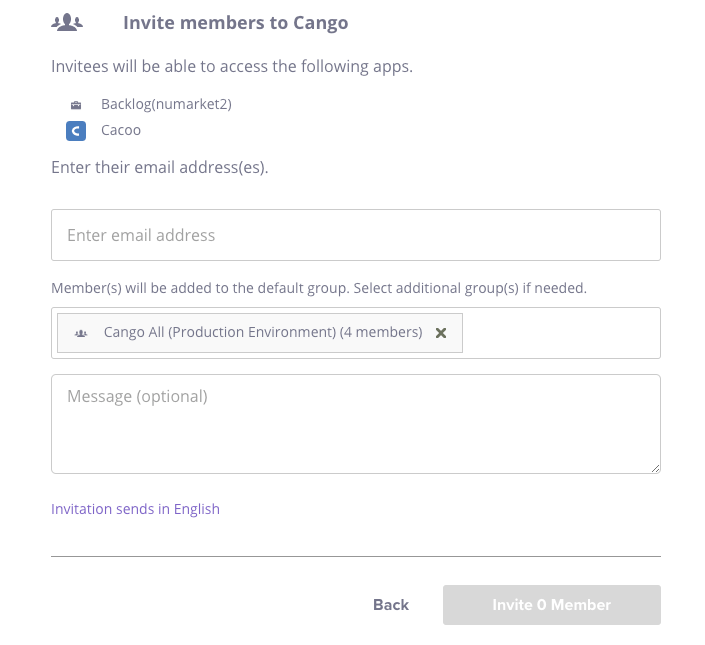 Users you invite will appear in the list of members with a tag indicating that the invite will expire within 7 days. This tag will be removed once the user has accepted the invitation. Invited users will receive an email invitation that includes a button they can click on to register on Nulab Apps. When the invited user has finished registering, they will be added to the organization. As soon as the user joins the organization, they can start using the plan. Member roles determine what users can do in the organizational space. These roles are managed on the Nulab Account. manage its members and teams. can create and manage teams. can share diagrams in the folders they belong to. Teams can be used to manage multiple members at once. For information on how to create them on the Nulab account, please visit this article. Teams can be used to invite or change the roles of multiple members at once instead of handling members separately. Since a team can be used for multiple folders, an organization member can be a member of all folders related to the team. Teams make sharing organizational diagrams easier. When a user is added to the Folder both as an individual and as part of a team, the individual user role will be applied. When a user is not added as an individual but with multiple teams, the highest role will be applied.